Marks on two 3.4-million-year-old animal bones found at the site of Dikika, Ethiopia, were not caused by trampling, as previously believed, but are likely the result of stone butchering tools. The new research supports the original interpretation that the damage to the two bones is characteristic of stone tool butchery. Those earlier findings were published in Nature in 2010. That conclusion was considered sensational, since it potentially pushed back evidence for the use of stone tools, as well as the butchering of large animals, by about 800,000 years. The Nature paper was followed in 2011 by a rebuttal in the Proceedings of the National Academy of Sciences that suggested the bones were marked by incidental trampling in abrasive sediments. That sparked a series of debates about the significance of the discovery and whether the bones had been trampled. For the current paper, published in the Journal of Human Evolution, researchers examined the surfaces of a sample of more than 4,000 other bones from the same deposits. They then used statistical methods to compare more than 450 marks found on those bones to experimental trampling marks and to the marks on the two controversial specimens. Evidence shows that our genus, Homo, emerged around 2.8 million years ago. Until recently, the earliest known stone tools were 2.6 million years old. Changes had already been occurring in the organization of the brains of the human lineage, but after this time there was also an increase in overall brain size. This increased size has largely been attributed to a higher quality diet. While some other apes are known to occasionally hunt and eat animals smaller than themselves, they do not hunt or eat larger animals that store abundant deposits of fat in the marrow of their long bones. A leading hypothesis in paleo-anthropology is that a diet rich in animal protein combined with marrow fat provided the energy needed to fuel the larger human brain. The animal bones in the Dikika site, however, have been reliably dated to long before Homo emerged. They are from the same sediments and only slightly older than the 3.3-million-year-old fossils unearthed from Dikika belonging to the hominid species Australopithecus afarensis. Thompson specializes in the study of what happens to bones after an animal dies. “Fossil bones can tell you stories, if you know how to interpret them,” she says. A whole ecosystem of animals, insects, fungus, and tree roots modify bones. Did they get buried quickly? Or were they exposed to the sun for a while? Were they gnawed by a rodent or chomped by a crocodile? Were they trampled on sandy soil or rocky ground? Or were they purposely cut, pounded or scraped with a tool of some kind? One way that experimental archeologists learn to interpret marks on fossil bones is by modifying modern-day bones. They hit bones with hammer stones, feed them to carnivores, and trample them on various substrates, then study the results. Based on knowledge from such experiments, Thompson was one of three specialists who diagnosed the marks on the two bones from Dikika as butchery in a blind test, before being told the age of the fossils or their origin. The PNAS rebuttal paper, however, also used experimental methods and came to the conclusion that the marks were characteristic of trampling. Thompson realized that data from a larger sample of fossils were needed to chip away at the mystery. The current paper investigated with microscopic scrutiny all non-hominin fossils collected from the Hadar Formation at Dikika. The researchers collected a random sample of fossils from the same deposits as the controversial specimens, as well as nearby deposits. They measured shapes and sizes of marks on the fossil bones. 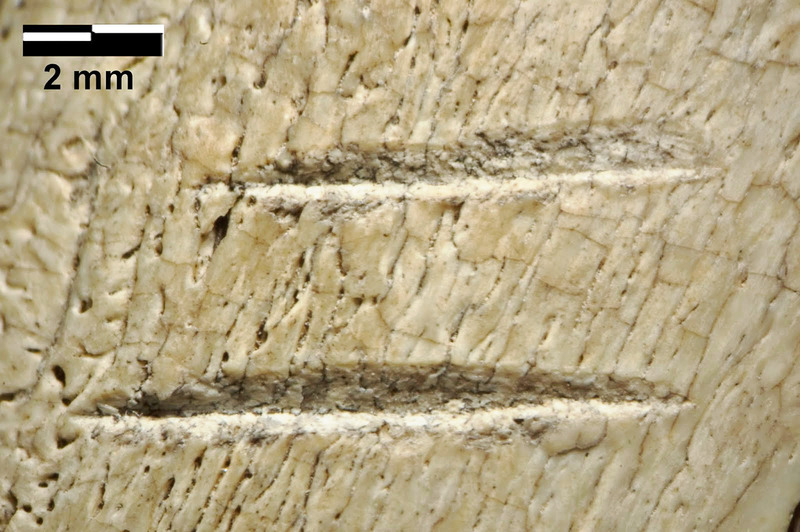 Then they compared the characteristics of the fossil marks statistically to the experimental marks reported in the PNAS rebuttal paper as being typical of trampling damage. They also investigated the angularity of sand grains at the site and found that they were rounded—not the angular type that might produce striations on a trampled bone. Trample marks tend to be shallow, sinuous, or curvy. Purposeful cuts from a tool tend to be straight and create a narrow V-shaped groove, while a tooth tends to make a U-shaped groove. The study measured and quantified such damage to modern-day bones for comparison to the fossilized ones. One hypothesis is that butchering large animals with tools occurred during that time period, but that it was an exceedingly rare behavior. Another possibility is that more evidence is out there, but no one has been looking for it because they have not expected to find it at a time period this early. In addition to Dikika, other recent finds are shaking up long held views of hominin evolution and when typical human behaviors emerged. This year, a team led by archeologist Sonia Harmand in Kenya reported unearthing stone tools that have been reliably dated to 3.3 million years ago, or 700,000 years older than the previous record.